Kagame, 59, won the election in a landslide, with over 98% of the vote, giving him a third term that extends his already 17-year leadership over the central African country. Of course, Roth faced backlash, mostly from young Africans on Twitter. The same backlash the Economist got when it dared to suggest, in a video published close to the elections, that Rwanda is, in fact, an authoritarian regime, where dissent may be a matter of life and death and democracy is yet to be competitive. “Travel through Rwanda and you will see order and cleanliness, and solid infrastructure. The country has changed a lot,” wrote one young Nigerian. “But Rwanda’s development under Paul Kagame has come at a cost, and this was the core message of The Economist’s video. Kagame’s time as Rwanda’s president has been marked by human rights abuse and stained by press repression and the fear of opposition. For many young Africans, Rwanda is a difficult question. Despite the fact that Kagame changed the rules in the middle of the game by manipulating the constitution to give himself a third term, the truth is that the Rwanda story is a success story. Indices from gender parity to unemployment prove that this president knows what he is doing – a rarity across much of Africa. Not to talk of the peace that pervades the nation that was tearing itself apart in a genocide only 20 years ago. Why would anyone want to change that? Well, the answer is history. The history of the continent is littered with cautionary tales along similar paths. Strongmen won freedom for their nations, beginning on the path to growth and transformation, only to fall prey to their own egos; becoming the problems they were meant to solve. Zaire’s Mobutu Sese-Seko, Uganda’s Yoweri Museveni, Sudan’s Omar al-Bashir, Cameroon’s Paul Biya, Angola’s Jose Eduardo dos Santos, Equatorial Guinea’s Tedoro Obiang, Liberia’s Charles Taylor, Nigeria’s Sani Abacha and of course, Zimbabwe’s Robert Mugabe are only some the highlights of a culture that prizes people and personality over systems and institutions. And the one thing that democracies across the world have proven is that effective institutions are best built under flourishing democracies. However, these dictators have taken nations of incredible wealth and promise and decimated them, supervising administrations of vast corruption, accumulating obscene personal wealth, and even worse, adding insult to injury by attacking fundamental human rights and creating climates of fear whose only purpose is to perpetuate their power. Sadly, they all began exactly like this. By being successful leaders, by being African heroes, by tampering with the constitution, by perpetuating themselves in office; by ultimately placing self above institutions. Africa loves Kagame for a very good reason. He is a glittering symbol of what is possible when visionary leadership meets a determined citizenry. 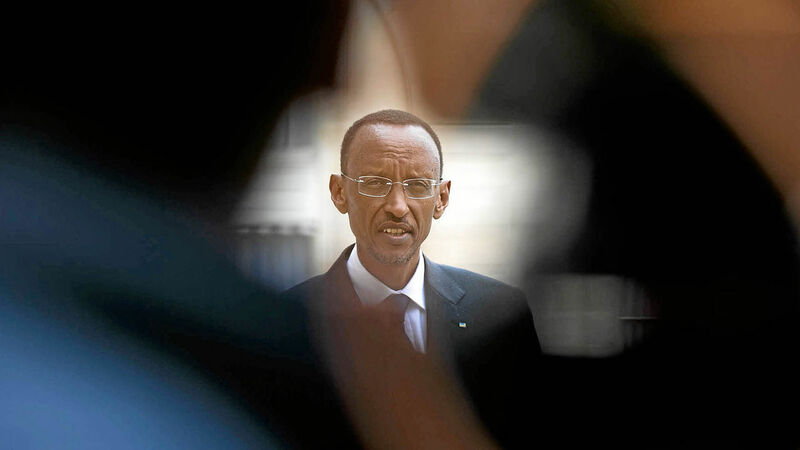 But it is precisely for that reason that Africa must hold Kagame to account. If indeed Rwanda is so peaceful, someone has asked, then why are there soldiers everywhere? Democracies thrive when they are truly competitive, supported by a plurality, a strong media, an independent judiciary, a flourishing civil society and citizen freedoms in deed rather than just in words. No one can say with a straight face that this is the case in Rwanda today. And that is a dangerous signal to the rest of a continent in the grips of dictatorship and autocracy. “Kagame is a friend to the youth, the role model for more generations,” @merarvm3 tweeted in response to Roth three days ago. Yes, he certainly is. Which is why it is time for him to set a good example, again, and strengthen institutions that can and should outlive him. So that when 2024 comes, he will have built the national capacity to leave office and to transfer power to another Rwandan with the competence and character to build on his progress. In doing that, he will not just be securing a pristine legacy, but he will be doing his continent a historic favour. Jideonwo is the co-founder of StateCraft Inc, which has consulted for presidential candidates in Nigeria, Ghana and Kenya. He is the author of the 2017 book, How To Win Elections in Africa.